The scheduled F2B Stunt and Vintage Combat competitions were held under blue skies with mild temperatures and light winds. This was in stark contrast to the previous weekend weather conditions with temperatures not much above 10 degrees celsius. A total of 4 F2B Stunt competitors flew 2 rounds each of the FAI F2B Stunt pattern during the morning with Mark Ellins again taking out top place. The regular ‘Michelin’ rated CLAMF BBQ lunch followed with some time-out to catch up on the latest news. Vintage Combat commenced mid-afternoon with lots of spills and thrills as the 6 pilots battled it out for supremacy. Graeme Wilson took out first place followed by Harry Bailey and Murray Wilson. Despite the absence of some top modellers who had only just returned from the World Champs and British Nats, it was still a great weekend of racing on the Albury hard stand. Classic B was first away and provided the standout performance of the meet with Chris Sculley and Steve Rothwell setting a new heat record of 2.52.54 with the OSFX powered modified Rocket. Well done! Next fastest were Hallowell/M.Wilson on 3.01, Justic/Stein on 3.03 and G.Wilson/Ellins on 3.17. These NSW hotshots have now skipped ahead of Victorian rivals Hallowell/M.Wilson on 2.55.75 and Justic/Stein on 2.56.38. Throw Harry Bailey and the SuperMacs into the mix and the Nats competition in 3 months time promises to be a beauty! Hallowell/M.Wilson won the final in 6.08 followed by Justic Stein on 6.14.31. Rothwell/Sculley retired at 60 laps after Steve aggravated an old foot injury while piloting. Vintage A gave more close racing with Richard Justic and Paul Stein crossing the line first in 6.52.14 ahead of G.Wilson/Ellins on 7.08.01 and Hallowell/Nugent on 7.15.38. Justic/Stein had the fastest heat of 3.15.64 followed by G.Wilson/Ellins on 3.21.44 and Hallowell/Nugent on 3.26.63. Rothwell /Sculley were again hampered by injury and eventually withdrew. 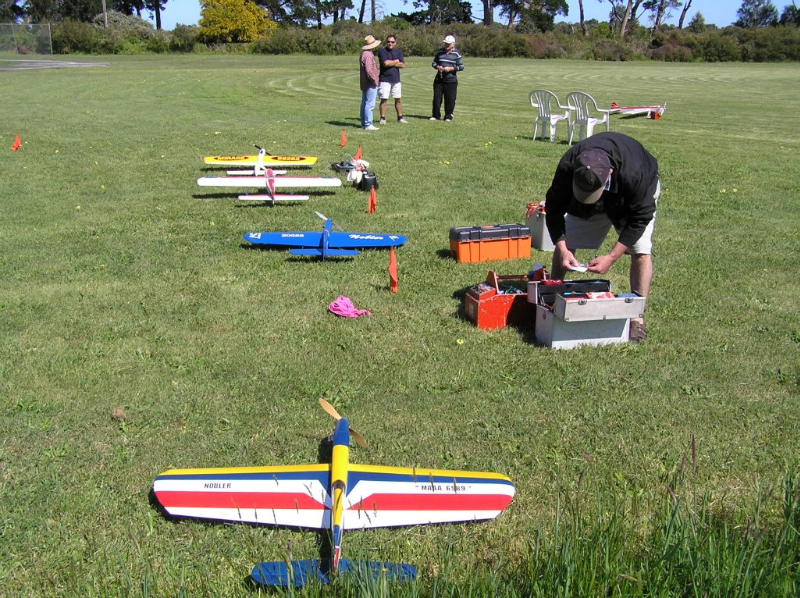 Classic FAI was the final racing event and proved to be a Fora fest! 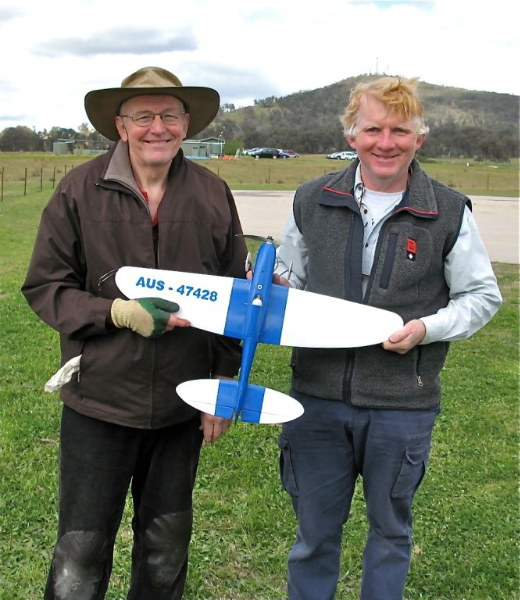 Again it was Richard Justic and Paul Stein who were fastest in the heats with a blistering 4.18.47 with the big winged Espadon. Andrew Nugent and Mark Ellins were not far behind on 4.26.31 followed by Murray Wilson and Neil Baker on 4.29.60. Unfortunately Rothwell/Sculley again had to withdraw. John Hallowell’s R250 Tiger had an excellent run but could not match the speed of the Foras and recorded a best of 4.36.37. Not surprising when you consider the 21st century technology in schnuerle ported ABC Fora Junior compared with an original Ollie replica of an engine designed almost 60 years ago! The main problem is range. While you can do 40+ laps at good speed on 15cc of Vintage A fuel, suddenly you have 50% less or only 10cc to get the required 35 laps in Classic FAI. The only way is to choke right down and then the speed goes down as well. There will be a Fora a in the Tiger for the next meet and the R250 will be back in what it was designed for and does brilliantly… hauling a Vintage A around at blistering speed! The final was a heart stopper and was eventually won by Justic/Stein in 8.43.31 from Nugent/Ellins on 8.46.53. Murray and Lege soldiered on despite a collapsing undercart, which made the landings resemble something you might see on the Benny Hill show. Although F2C was not run and Speed flying was mainly confined to practice, the social factor of the weekend was high with all modellers enjoying top meals at some of the local pubs. All in all, considering the chilly wind and low entry numbers, it is safe to say all who attended this Albury meet had a really good time.